Monetize your web with new promocode and offer from H10 Hotels, providing 18% off on hotel stays. Take this advantage to increase your commissions! Good luck with your promotion! Monetize your web with a new promocode and offers from H10 Hotels, providing up to 15% off on hotel stays. Take this advantage to increase your commissions! Description: Book your stay in the Caribbean with Ocean by H10 Hotels and get an additional 15% discount. Monetize your web with a great new offers from H10 Hotels providing up to 13% discount on Hotel stays. Take this advantage to increase your commissions! - Valid for stays from 15th April to 31st October 2018. T&C: Offer valid until 31st May, 2018. T&C : Offer valid until 31st May, 2018. For further information, please feel free to contact us at operations@affilired.com. Monetize your web with Design Hotels Easter & special culture offer, providing up to 20% off on staying at their hand-pick of hotels worldwide. Take this advantage to increase your commissions! Description: Break from the chocolate egg tradition this easter and discover a new place with a unique indulgence. Choose from destinations such as Thailand, Switzerland, Cyprus, London, and more with Design Hotels and enjoy up to 20% off. - Booking period: Now until 23rd April 2017. - Staying period: From 27th March to 23rd April 2017. - Minimum stay of 2 nights required and specific conditions may apply per hotel. Description: With this special culture offer by Design Hotels ensure your stay includes access to the right museum or art galleries, and more. Book now and get up to 15% off and complimentary breakfast. - Booking period: Now until 11th June 2017. - Staying period: Between 27th March and 11th June 2017. - Minimum stay of 2 nights required to get 10% off and minimum stay of 3 nights required to get 15% off. - Specific conditions may apply per hotel. Monetize your web with Lebua Hotels & Resorts 'Easter' promo codes, offering up to 47% off on staying at their hotels in Thailand. Take this advantage to increase your commissions! Description: Make your Easter time more delightful with extra special "Early Easter Offer" at Tower Club at lebua and get up to 47% off on room with breakfast! - Booking period: Now until 30th April 2017. - Staying period: From 11th March to 30th April 2017. Description: Enjoy the "Early Easter Offer" at lebua at State Tower and get up to 47% off on room with Internet or room with breakfast. Book now! - Staying period: 11th March to 30th April 2017. Design Hotels Easter Deal, Providing Up To 20% Off At Their 41 Hotels Worldwide. Increase your commissions by promoting Design Hotels Easter deal, providing up to 20% off booking at their selected 41 hotels worldwide. Wait no longer and monetize you web with this special opportunity. Description: Design Hotels are offering deals on some truly spectacular hotels, from Europe to Asia with discount up to 20% off the best available rate. Plus, to make this Easter deal complete, get complimentary breakfast and a welcome drink. Take this advantage to increase your commissions! Take the advantage of Easter promo codes from Lebua Hotels & Resorts, providing up to 46% off staying in their hotel "Lebua at State Tower" Bangkok. Promote the deals now and increase your commissions! Description: Book your easter holidays now at Lebua at State Tower, Bangkok Hotel and get discount up to 46% on room with internet. Park Inn: Nordics Easter Sale! Park Inn properties are friendly, fresh, vibrant and uncomplicated. From functional guest rooms to flexible meeting spaces, the whole guest experience at Park Inn is designed to be totally reliable and hassle-free! Help your readers enjoy a getaway at a nearby or faraway Park Inn by promoting our great rates and deals below. If you have any questions please get in contact with us via the details listed below. Promotion: Save up to 25% off on selected hotels in the Nordics. The offer is valid for new bookings on February 25 - March 14 2016 and with stays between March 18 - April 3 2016. Book well in advance for best hotel availability and receive up to 25% discount. Monetize you web with "Barcelo Hotels & Resorts" Easter, promo code providing 5% extra discount + other exclusive benefits and offer providing up to 30% off on staying at their selected Hotels in Rome, Milán, Istanbul, Madrid and Barcelona. Wait no longer and Start promoting this special deal for your users. Have a holiday at Easter with your family, friends or partner at Barcelo Hotels & Resorts and get up to 30% off. Extend your stay and get better discounts for the main European destinations, hotels in Rome, Milán, Istanbul, Madrid and Barcelona. In addition, register on Barcelo.com and you receive reward worth 5% off the cost of your booking, plus the best guaranteed rate. - Period of stay, reservation and minimum stay may vary by hotel, check conditions. Easter Weekend Sale at Bench.ca! Wish your Friends and Family a Happy Easter this year with JibJab! Egg-celent Easter Savings with Monkey Sports! Easter savings at Jelly Belly! 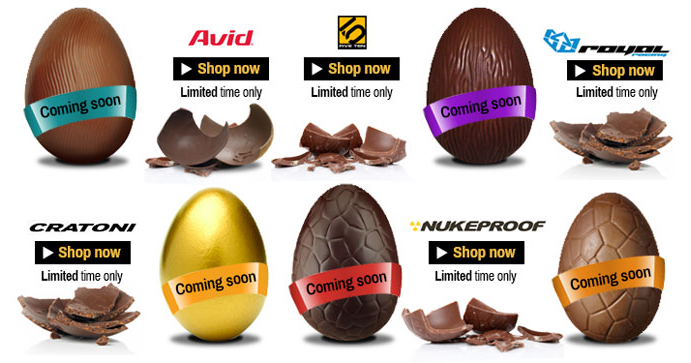 Easter Brand Bonanza at Chain Reaction Cycles! Offer: Get an Extra 10% off top brands! Celebrate Easter with Jelly Belly! Tell your readers about the great savings at jellybelly.com! Why not add some Jelly Belly jelly beans to your Easter basket this year! Also, find Jelly Belly's latest offers below! Offer: Shop Jelly Belly deals and gifts under $10 - Shop now! Valid until: 10/9/14 Link: http://www.awin1.com/cread.php?awinmid=4444&awinaffid=!!!id!! !&clickref=&p=https%3A%2F%2Fwww.jellybelly.com%2Fsearch%2Fgo%3Fp%3DQ%26lbc%3Djellybelly%26uid%3D258149135%26ts%3Dcustom%26w%3D*%26isort%3Dglobalpop%26method%3Dand%26view%3Dgrid%26stateid%3Ds1C11A21C1XvxGak6u%26modaf%3Dr%3Apb%3Aunder10%20 Offer: Free Shipping on every order $55 or more! Valid until: 8/27/14 Link: http://www.awin1.com/cread.php?awinmid=4444&awinaffid=!!!id!! !&clickref=&p= Offer: Harry Potter fans will love Jelly Belly's delicious milk chocolate frog with crisped rice. Each one comes with a collectible wizard card! 16 cards total, collect them all! Now only $2.99 each! Valid until: 6/30/14 Link: http://www.awin1.com/cread.php?awinmid=4444&awinaffid=!!!id!! !&clickref=&p=https%3A%2F%2Fjellybelly.com%2Fproduct%2F621%20 Offer: Jelly Belly has taken your favorite draft beer and turned it into a gourmet jelly bean! Shop Draft Beer Jelly Beans Only $8.99 each! - Click here! Valid until: 6/30/14 Link: http://www.awin1.com/cread.php?awinmid=4444&awinaffid=!!!id!! !&clickref=&p=https%3A%2F%2Fjellybelly.com%2Fproduct%2F1001%20 Offer: Shop the best selling BeanBoozled collection at Jelly Belly! Stinky Socks or Tutti Fruitti? Peach or Barf? They look the same! Starting at $2.25 a box! Click here for more! Valid until: 6/30/14 Link: http://www.awin1.com/cread.php?awinmid=4444&awinaffid=!!!id!! !&clickref=&p=https%3A%2F%2Fwww.jellybelly.com%2Fsearch%2Fgo%23%3Fp%3DQ%26lbc%3Djellybelly%26uid%3D258149135%26ts%3Dajax%26w%3Dbeanboozled%26isort%3Dscore%26method%3Dand%26view%3Dgrid%26modaf%3Drn%3Acat1%3Abeanboozledjellybeans%20 Remember to change !!!id!!! to your affiliate ID in order to ensure proper tracking! Join the Jelly Belly program to start earning 8% commission on all purchases!